A 2-year-old California boy was killed last May after being crushed by an IKEA dresser that was subject to a recall in 2016, IKEA said Wednesday. A lawyer for the family told ABC News that the boy was crushed by a MALM dresser after being put down for a nap in his bedroom. The family did not know the dresser had been recalled and plans to file a lawsuit, the family's lawyer said. 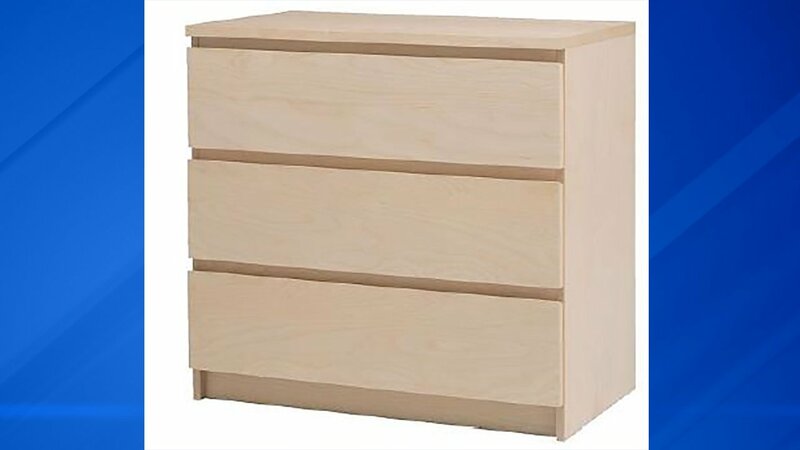 In June of 2016, IKEA announced a recall of 29 million dressers, including the MALM models. The death is the eighth linked to the recalled dressers and the first since the recall was announced. "Through the Consumer Product Safety Commission (CPSC), we have learned of a tragic tip-over accident which reportedly took place in May 2017 in California. Our hearts go out to the affected family, and we offer our sincere condolences during this most difficult time. The initial investigation indicates that the chest involved in this incident had not been properly attached to the wall. IKEA urges all consumers to securely attach chests to the wall with the hardware included in every IKEA chest of drawers package. Wall attachment is a necessary part of the assembly instructions, which must not be overlooked. If it is impossible for units to be attached to the wall, consumers should choose a different storage solution. The June 2016 chest of drawers recall in the US offered consumers a choice of several remedies which are still available today, and which we have communicated to consumers since the recall via our web site, through social media and email campaigns. Options available to consumers include having the chest removed free of charge from the consumers' home, having the chest anchored to the wall in the home free of charge, receiving a free wall anchor kit for self-installation or returning the product for a refund. At the same time as communicating the recall, we are continuing to communicate the global IKEA Secure It! campaign to raise the awareness of the importance of wall attachment. Consumers who want to participate in the recall, can do the following: learn more about how to safely attach units to the wall, order a free replacement wall anchoring kit, visit our website www.ikea-usa.com, or can visit any IKEA store." For more information on the recalled dressers, click here.